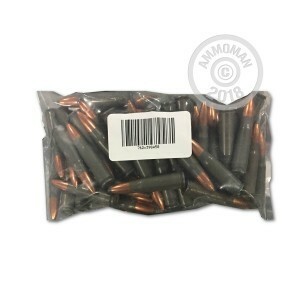 You'll receive 50 Rounds of mixed lot, steel and/or aluminum cased 7.62x39mm Ammo, loose packed in a clear plastic bag. All lots may contain a unique mix of range and defense ammo, in a number of different bullet weights, from a variety of manufacturers. Great ammo at a great price fast shipping was on my door step within a couple of days ever round went bang and that's all I can ask of it. I actually prefer the packaging of baggies I don't want to pay extra for a fancy box that I'll throw away anyways! I got 500 rounds, it was a good 40/60 split of HP and FMJ ammo. I've shot around 200 of mix and all have gone boom. I'm breaking in an npap with it and so far it's grouped at about 2.5" at 100. Overall I'm very pleased. but at 27 cents a round that's no great deal, you can get this ammo boxed for 19 cents other places. sell for that or less that would be a deal. great deal if you wanna do 500 at a time. keeps the wife from asking questions about the bank account. Great mix of ammo can't beat the price. Gonna keep ordering my AK ammo here. Definitely great buy on mixed bag of Tula. Mostly FMJ. There were a couple HP. FAST and free shipping. FedEx does a GREAT job! $.50 cheaper now than when I ordered. If you're not buying a 1000 rounds, this is a really good price. 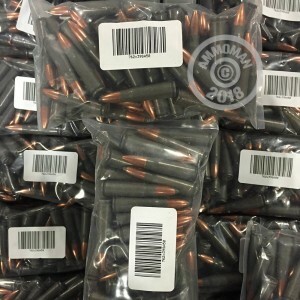 Just as advertised...ordered 500 rounds and they all came in small plastic baggies. All Tulammo, mostly FMJ but there were 1 or 2 HP mixed through out. Was hoping for more SP but at this price you cant complain. I used some of my built up rewards points and scored 500 rounds for $120 cant beat it! Bought 500 rounds with a mix of FMJ and Hollow Point all Tula. 150 rounds shot with out any problems. Great value on 7.62x39 ammo! Ordered the bulk packaged 7.62x39 and got a great deal. All Tula ammo, mostly FMJ with an occasional soft point mixed in. Great ammo at a great price with great service! I ordered 500 rounds of this because it's one of the only ways online to get 7.62x39 for this price a round without ordering 1000 rounds. It's a nice mix of soft point, hollow point, and full metal jacket Tula ammo. The ammo arrived to my door in about 3 days which is superb considering shipping was completely free. I'll always buy my AK ammo here if they keep this deal up, it's 1 or 2 cents cheaper per round than buying locally for me.